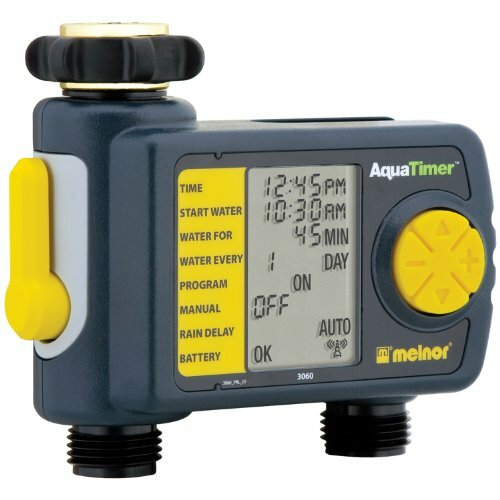 If you'd rather have time to sip lemonade than spend time watering your lawn or garden, start thinking about a Melnor electronic water timer. 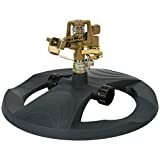 Here's how simple it can be: attach the timer to your hose faucet, press a few buttons, and use the digital display to set the clock; then just press a few more buttons to establish a preset schedule, watering up to six times a day. That's it! You're free to enjoy a frosty beverage on your deck. Or water while you sleep in, taking advantage of the cool morning air to avoid excess evaporation. Either way, you won't have to worry about overwatering. I own two of these and love them. This has the most flexible scheduling I've ever seen. You can use the mist setting which allows the timer to run for 2,5,10, or 15 minutes then set off for 10 minutes then turn back on again. This is the best feature as it allows the water to soak into the ground instead of run off not to mention lower watering bills for the same green lawn. If you have weak water pressure, using this mist setting to have two of the timers alternating between on and off. One is on for 10 minutes while the other is off. For large sod installations, this timer is great. If you buy a 4-1 splitter of the main pipe, then attach these timers, then a 2 to 1 splitter, you can run 8 sprinklers on alternating time patters that allow each set of sprinklers to maintain high water pressure. No more moving sprinklers around! You can set 6 different on/off times during ONE day if you need to. 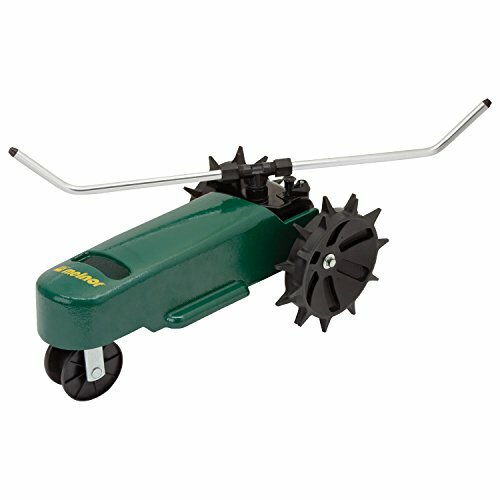 Great for new sod or overseeding a yard. Keeps it wet all day. You can select which days of the week to run or odd/even. It saves 5 different schedules. There's even a schedule that only runs once. The other feature I love is the elmination of "water hammer." With other timers, you know when it stops because of that loud THUD! This timer has a more gradual open and shutting of the valve that elimnates that loud thud in your pipes. I use this timer for two drip irrigation systems and it has been fantastic. You will not find this many features elsewhere for the same money. The programming is reasonably intuitive and easy to learn, and once you get the hang of it you can create a new program in seconds. I created five programs with varying watering times so that as the weather changes I can easily increase or decrease the amount of water delivered by just switching programs. I haven't had any problems with reliability or battery usage. My timers were both running at least once a day all summer and after four months of this they were still going, so I don't know why others were having problems with this. Someone else recommended Nelson timers but I disagree - I went through nine or ten Nelson EasySet timers and they all failed (OSH took them back under warranty). Besides, the Nelsons use C batteries, which are more expensive than the AA batteries used by the Melnor. The good: This is by far the most flexible timer I could find. I have not had any problem with battery life. I ran the timer every day during the spring and summer and it lasted until the next season. 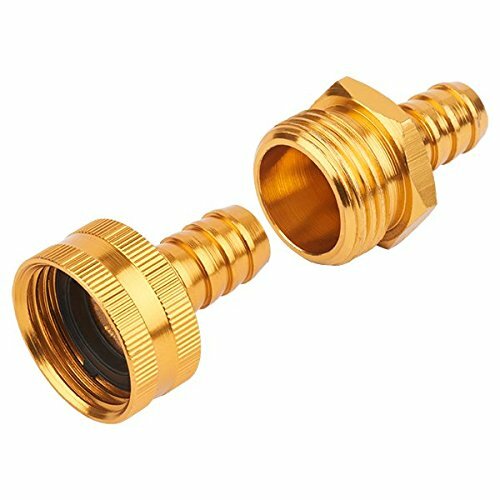 The bad: I second the notion that the plastic hose connector is a bad design. I have three of these timers and one of them sprung a leak after only a year of use. Another drawback is that the programming interface is not intuitive. I have bungled the programming on more than one occasion, and in one case I was able to create a watering schedule that was scheduled to water on no days! What good is that? Another problem is that one of my timers got water inside and damaged the display. It is still readable, but obviously it wasn't watertight. 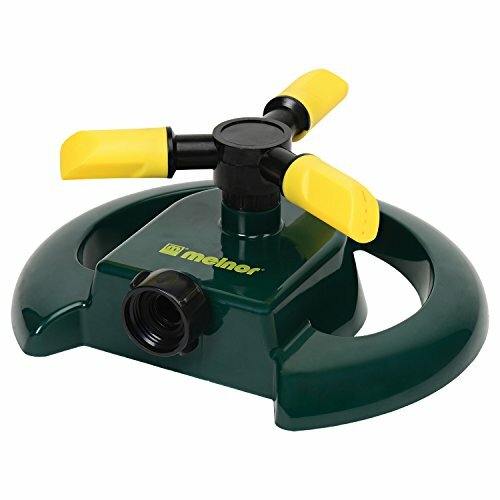 I have owned 3 of these Melnor timers and must say that they are quite flexible. 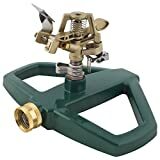 But they are not intuitively easy to program and they suffer from the major flaw in faucet timers - a plastic connection to the faucet. Over time, the connection will loosen and water will leak into the unit and cause it to fail for any number of reasons including rust, battery corrosion, etc. Simply stated, never buy a faucet timer that doesn't have a brass connection to the faucet. 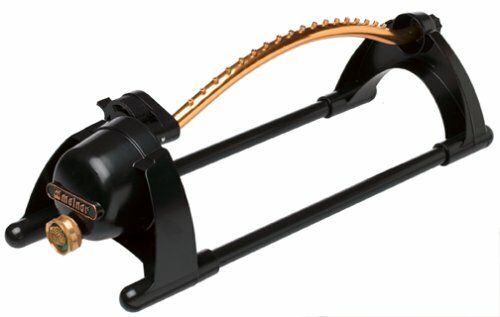 I have had good luck with Orbit timers and they provide a 4 year warranty on at least some of their models. Best sprinkler I've ever used. This hose is not very durable I only used it a few times and it busted and I can't find any place to get a connector to fix it. 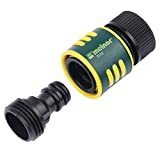 I brought this hose after a girlfriend suggested it, if you only need a small amount of hose I suppose it might work fine. I brought the 75 foot length,and ultimately need to unwind the hose completely. 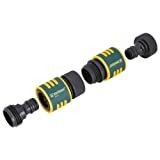 Poor water pressure and trying to wind this hose back up is a workout, what a joke, wish I had read these reviews before I wasted my money. Bought this hose from a retailer. Seemed like a great concept, but in practice it was harder to reel in than I had hoped. And after a few days the thing burst -- big 2-inch hole in the side. Don't waste your money. While the idea of the Magnahose sems quite good, in reality the product is just about useless. Poor craftmanship is the first indication of the overall terrible quality of this hose...it is of a flimsy and cheap construction. The design of the hose also gives you next to no pressure at the nozzle. My magnahose can only send a jet of water about eight feet while another hose on the same tap can shho well over twenty. Don't waste your time or money on this terrible product. Melnor should be ashamed. 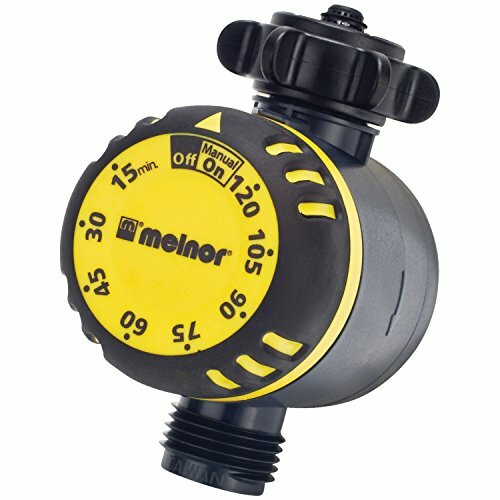 If you're looking for a serious sprinkler you can still count on 10 years from now, the folks at Melnor have produced a candidate for you. 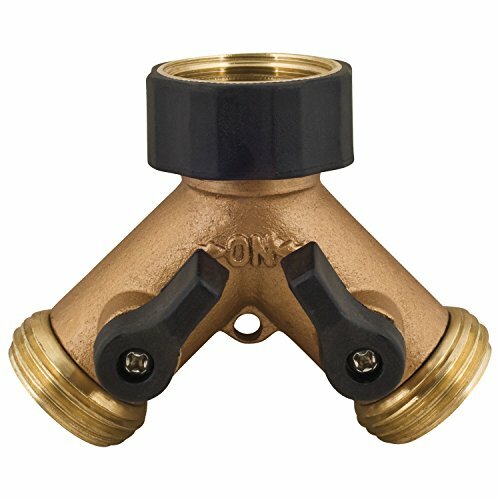 This pulsating sprinkler from their Heritage line is built of durable, noncorrosive, all-metal parts and is guaranteed by Melnor for as long as you own your home. Considering the life span of your average sprinkler, that's a pretty good offer. The base is constructed of durable steel, heavily coated and sealed in black enamel. The hose coupling and sprinkler apparatus are made of brass, a metal known to hold up indefinitely to weather. I have lots of beds around my house. I do very little overhead watering, and I have soaker hoses, and hoses running to remote soaker hoses, all over my yard. I have quick disconnects everywhere, and I can start watering any bed I want immediately. But I have two problems that I needed to solve. One was that I tended to forget I had started watering something, and the other is that after a tour of the yard, I may want to water everything at once. Both of those problems are solved with a timer. While I haven't tried every timer, I've tried a few. There are simple count-down timers that only time how long (or how much water) you put on, but cannot be set to start later. They're cheap, and they only solve one of my problems. This timer has some limitations on how you can set your schedules. It keeps track of how much time has passed, but it doesn't have a clock. You tell it how far in the future you want the first cycle to begin, and it works from that point. The first cycle can be set to be one-time only, or to repeat every 1, 2 or 3 days. A second cycle can be set to start after the first time the first cycle runs, again with the same options. The first cycle cannot be set to start more than 12 hours after programming. Thus is you want the water to come on at 5am, you can't set it any earlier than 5pm. Once you have the schedules set, there is no way to tell what the schedule is. If you are in doubt, you may need to reset it, and start over. On the other hand, I have a different, less expensive timer that I like better. That timer only has one schedule, but has more options of how often it is repeated, as little as every couple of hours, or up to a full week. On that timer, I also set the time of day. This means I can set it up to 23 hours in advance. It also means that I don't have to count how many times I press a button to make it start at 5am. I simply choose 5am on the dial. I find that timer meets my needs better than this one. I would submit to you that unless you have a small yard that can be considered only a single zone, you will want more than one timer. You may also not realize which features you like best until you actually try them. 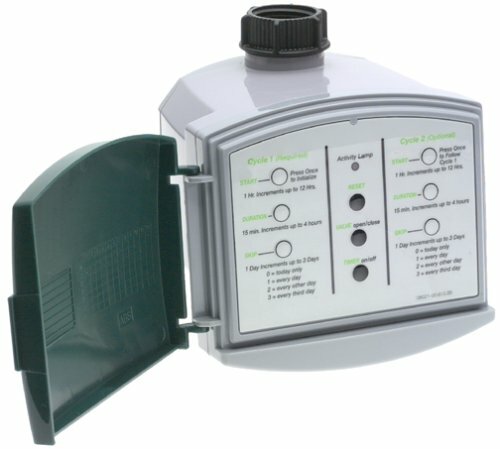 If two distict watering schedules for the same zone works for you, this may be the right timer for you. On the other hand, I found a less expensive single-schedule timer that better fit my needs. Ultimately I put this timer on the drip irrigation zone that includes my tomato and pepper garden. I anticipate freqently changing the schedule, and I will be freqently watering this plot. So it matters less that the repeat function choices are only every 1, 2 or 3 days, and I don't have to worry about resetting the clock each time I change the schedule. I doubt that I'll be buying more of this timer, but that's not to say it's a bad timer. It's just not the right one for the way I use timers. They have a new model (cylindrical shape) and 2/4 of these have broken within the first year. Extremely frustrating waste of time. Avoid these electronic timers. Easy to attach, very easy to use. I had some trouble getting the threads to line up with my ancient spigot, but once I did, no problems at all. I would recommend that this timer NOT be left out over winter -- put it somewhere that the freezing temperatures won't cause it to crack (maybe water stays in the timer and expands into ice?). I had this happen to me, but the replacement has been fine since I took out of the cold over winter. This product works exactly as described. 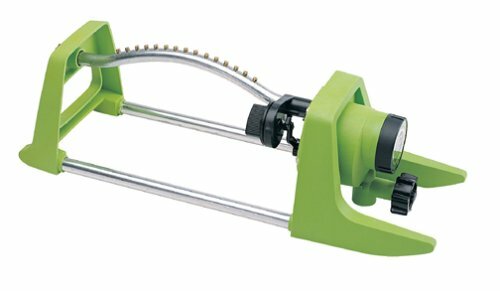 It is simple, so easy, so convenient, we really enjoy using this. NO MORE FORGETTING THE SPRINKLER IS ON!!! We like the way it turns the water off at the faucet, not leaving pressure in the garden hose. 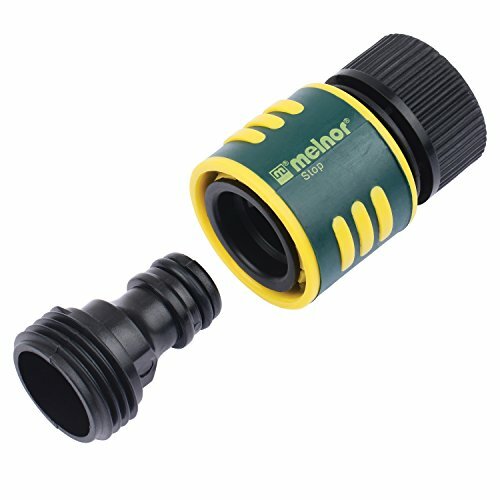 If your water rates are as bad as ours in McHenry MS, you need one or several of these (we have 5), Melnor has always been an excellent quality product. I bought this in the off-season and put it up on my shelf and sort of forgot about it. Now it's about time to start using it since it's getting hot down here in Atlanta. Hooked it up and noticed it had a hole in it. Leaks like crazy. Absolutely worthless to me. Of course, by now I've thrown away the box and the paperwork, so shame on me. Grief. Grief. Grief. Money down the drain. Just bought two. Nice and small, and reasonably well constructed. No pipe-banging cut off (as advertised). The knob is somewhat tight and slightly hard to turn to manual on/off, but not that big a deal. Although it advertises 15 minutes to 2 hours, mine have settings for 5 and 10 minutes as well, both of which work as indicated. The only thing that keeps it from 5 stars is that the dot increments are odd. Between 30 and 60 minutes, there are 3 dots, making each dot 7.5 minutes. The same goes with the 60 to 90 and 90 to 120. Trivial, but would it have been that hard to have 5 dots for 5 minute increments or just two dots for 10 minute increments? 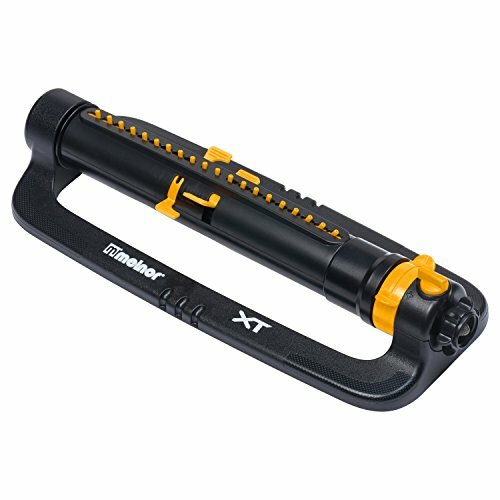 Heavy-duty 5-ply Garden Hose with built-in Quick Connects. Waters up to 13,000 square ft. The Best Sprayer Handle Yet! 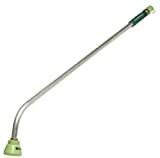 I bought the Melnor 5390 spray wand for my wife. She is a short person, making it difficult for her to water the many hanging planters we have around our yard. The Melnor wand now makes this job one of enjoyment. She no longer gets wet trying to reach the plants with a drink of water. The on and off lever is a wonderful feature, allowing her to use it in different areas of the yard with out wasting water. This is a wonderful product. I found this works better than their similar brass product.